One of the very first things I do when October hits is stock up on cans of Libby's Pumpkin. Pumpkin is such a versatile food, and one that can be leveraged in every meal, from breakfast to dinner. The many benefits of pumpkin (think low-cal with lots of vitamins) make it a perfect option when looking to lighten up a dish. With my canned pumpkin in hand, I set out to make over one of my favorite morning treats: scones. Dense and full of flavor, scones make a perfect breakfast or an easy grab-and-go snack for an afternoon pick me up. 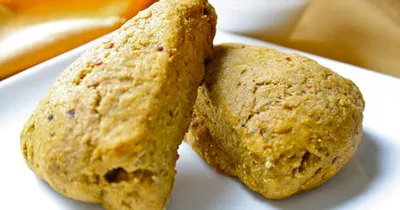 Using this recipe for Pumpkin Scones, I made the following substitutions to create a (nearly, save for one egg yolk) vegan pumpkin scone recipe that even I had a hard time believing was good for me! These scones far exceeded my expectations. They were not as sweet as a store-bought scone (though a nice glaze on top could easily up the sweetness if you prefer your scones that way) but just as delicious in their own right. The white whole-wheat flour added a nice heartiness without masking the pumpkin flavor. Each substitution above led to a fluffy, almost biscuit-like scone bursting with pumpkin flavor. Overall, another recipe makeover success!